Hi friends! I have the pleasure of knowing a power couple whose goals are to follow their dreams of running their own businesses. You may remember my feature post about Sarah Key, and her career with Rodan & Fields skincare. Well, her husband, Justin Key, has his own photography business: Justin Key Photography. Pretty cool huh? To me this photo represents a few different in-depth ideas. There are independent branches, but they are intimately intertwined. It represents us as people; we are individuals who need interaction, support, and inclusion. To me this photo represents a holistic and spiritual world — a humble reminder that you are part of something much larger than life itself. It’s family, work, play, love. With that said, please join me in learning more about Justin, and how he got to where is today in his photography career! I have shot darn near everything when it comes to photography. I started out shooting sports primarily and loved it but my focus has shifted over the years. I would still love to shoot sports because being on the sidelines of big games is a feeling unlike any other. I’ve tried portrait and weddings but I have a hard time directing people so I have tried to distant myself from that genre. Landscape and travel photography is what I’m focused on now and see myself doing going forward. I like to look at my work as art, I don’t shoot a lot of the colorful sunsets or breathtaking panoramas, I try to find a sense of place in my photography. I like to think of my work as capturing the character of Earth. I’ve always been drawn to nature and travel and my eye tries to capture the moments and the details that make up the memories we take from places. I don’t know that I have crossed over into the fine art realm quite yet but that is the type of work I would like to be classified under some day. My current goal is to become self sufficient through my photography and I’m hoping to do that in the next year or two so looking beyond that is tough. I see a lot of growth that can be made in my work. I continue to look at my images and think they could be so much better than they are so in 5-10 years I would like to see my portfolio improve to the level I believe I can achieve. I would love to have checked off a lot of places on my travel list and see my name grow larger in the photography community. I plan on sticking with my landscape work and am currently in the works of expanding my website to include a new segment of my work I’m calling the Long Shutter Project. Currently it will be a collection of abstract series with the goal to raise money for muscular dystrophy but I see it expanding beyond the single cause down the road and I hope in 5-10 years to have raised a good amount of money for those causes. If I had to give aspiring photographers advice or even thinking about what I would tell myself starting out would be not to be afraid. I spent a long time doubting myself and worrying about the potential of failure and it held me back for a number of years. Once I got over those fears and doubts, I’ve seen my work improve, I’ve seen more opportunities come my way and I believe more in myself and my future. You can’t be afraid to chase your dreams and the sooner you can believe in yourself and put the time in to make it happen the sooner that dream becomes a reality. As a landscape photographer obviously Ansel Adams has been a big inspiration to me. I did a study in college of Masumi Hayashi’s technique and her work gave me a different perspective of the way we view scenes. Art Wolfe has some incredible work, Martin Bailey has a style similar to mine, I have been listening to his podcast for a while because he has a lot of the same views as me and it wasn’t surprising to find our work is pretty similar. Mark Rothko is a painter I have been inspired by as well. Well, friends, thanks for reading! It’s so rare to find a passion and turn it into a supportive career and I envy Justin for doing just that! I hope Justin’s post inspires you to stick with your passions, and even if you figure you need to do something else for ‘work’, make sure to leave a large space in your hearts and schedules for passion projects. Check out his Instagram: @JustinKeyPhotograhy and his gallery to see more of his portfolio. Hi friends! I am very excited to share this spotlight post featuring my former hair stylist, Nikki Johnson. 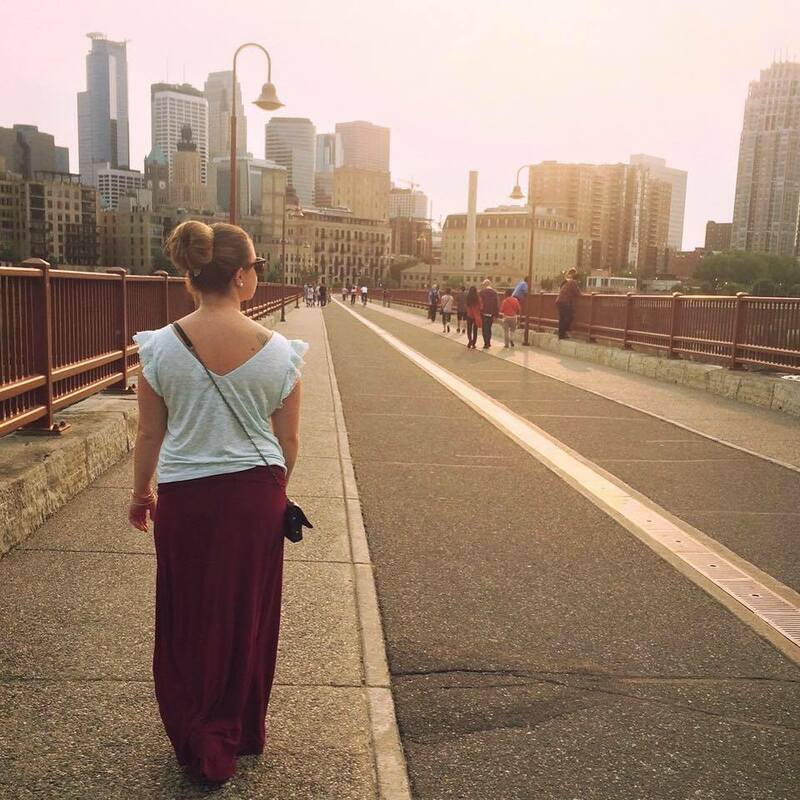 I started seeing Nikki at Aveda’s Kai Salon in the North Loop, Minneapolis, and it was very apparent each time I visited Nikki that she had some major ideas to pursue her dreams. We’d often talk about our work, what makes us happy, how we find balance (there’s a lot of time to talk with a full balayage, cut, brows), etc. After a couple of WONDERFUL years of seeing Nikki, she told me she would be leaving Minneapolis to move back home (a dream she was quite open about), and start her own salon. I was initially sad, because I’ve made a new friend in the city and as many women know – you get to know your hair stylist pretty damn well! Her excitement was contagious – she was grinning ear to hear and just glowing with determination. I immediately felt SO excited for her. So, now that some time has passed, I’ve asked her to put together a post on her journey to opening The Shop Salon in her hometown of Rushford, MN. Enjoy! My first official day working in the salon was July 27, 2017. This was my Great Grandma Clara’s birthday. The day I had my ribbon cutting ceremony was August 3, 2017. This is my Grandma and Grandpa Graham’s wedding anniversary. I didn’t plan on these synchronized dates, they just happened. I always have had an entrepreneurial spirit. In my first job out of college I received a she “Grabs the Bull by the Horns” award, and throughout my career previous to hair I was told . . . “You have fire in your belly.” I have always been self-motivated and excited about doing a job well done, but it wasn’t until I was 27 years old that the idea of owning my own hair salon found my mind. I never really intended on leaving the bluffs, I’ve always loved this hidden gem tucked in the valley. I was never an, “uh. . . just get me out of here” kind of person, but it’s interesting how life just takes you where you need to go. My journey was different because it had to be. I had to get to where I was going in a round about way in order to shape me into who I am today, and I am forever grateful for each and every person that I’ve met and learned from along the way. We grow from those that surround us, and I know I wouldn’t be the me I am without ever having left and experiencing all that I did. I worked in hospitality sales from the day I graduated college in 2007 to 2012. I initially loved it. It fit, and then it didn’t. I was burnt out and not passionate. I didn’t see it fitting me for the rest of my life. The day I realized I outgrew the hospitality industry was in December of 2011. It was a very clear moment for me. One that I feel very fortunate to have experienced. Here’s the story prior to my “ah-ha moment” . . .
After a long day at work my boss pulled me into his office and told me that the outfit I was wearing was not “professional enough.” It was. I’ve always been a bit more fashion conscious so maybe he didn’t like the trend . . . but I can assure you it was “professional enough.” In order to prove a point to myself I wore the exact same outfit a week later, only this time I curled my hair and wore heals (previously my hair was in a pony and I was wearing flats). Nothing was said a week later. I proved my point (to myself) but I was angry and annoyed. I was angry at the situation and annoyed at the idea of someone telling me how to dress every day of my life. Don’t get me wrong . . . I understand dress codes exist for a reason, however, to me, the way you dress is an expression of who you are, and I didn’t want people telling me how to express myself on a daily basis. I didn’t and still do not like the idea of creating expressive parameters such as this. The thought of someone or a company monitoring my attire felt trapping. I also worked with some pretty miserable people. Miserable in the sense that they hated their jobs, not miserable in the sense of defining their character. They were good people. Good people who despised their work environment. Most of my work week was consumed with constant chatter collectively complaining about this and that . . . about our boss, about the work environment, about how there was never any time for family or friends, that they’d miss a baseball game or ballet recital because of work and the list went on and on. This talk wasn’t just on my coworkers, I 100% participated in this negative monkey noise. We were one big unhappy corporate family that fed off each other’s woes. I saw the weight. I felt the weight. My head spun. I was like “No, I can’t. I can’t be this.” I did not want to fall down the funnel as far as my coworkers had. They were all older than me and truthfully, I saw myself trudging in their muddy footsteps if I did not drastically change directions. The thought of staying in this career made me uneasy. If any of you are reading this that were involved in this part of my journey please know that I am not trying to project negativity toward you . . . rather I am trying to be truthful to the situation, and without having faced this particular darkness I would not be where I am today. I felt emotionally and physically drained, and I certainly wasn’t proud of the person I was becoming. Prior to these events and observations, I already knew that I had fallen out of love with hospitality. My passion and light for the industry in general was dim, and I knew I needed to change something or I would be stuck in the muddy muck. Now back to my ah-ah moment. It was the end of the day when my boss pulled me into his office to talk about my attire . . . as he spoke to me I tried my hardest to not let him see that his critiques were affecting me. I quietly nodded my head and said, “Okay.” I walked out of his office, shut down my computer and took the elevator home (I had just moved back from Dallas, TX and was living in the hotel as I had not found a place to rent in Minneapolis yet). I decided to go work out and try to move my emotions in a more positive direction. It did not work. I was still upset. When I got back I walked into the bathroom and just stared at myself in the mirror. I said out loud . . . “What am I going to do with my life.” I really just thought I was having a moment asking myself a rhetorical question and would go on with my night but honestly, I just stood there looking at myself and thought quietly in my mind . . . “I should go to hair school. I would be good at it because of ‘XYZ’. I could move back home one day (which is something I’ve always wanted to do), and . . . and, I could open up my own salon! Be my own boss. Wear whatever I want.” Yep, my mind was set. I sat on one of the queen beds in my double room and I wrote down all the things I’d love to have in my shop someday. I still carry that piece of yellow paper in my purse and the coolest thing about it is . . . a lot of what I wrote a little over 6 yrs ago actually exists in The Shop today. December 2011 | The dream, the vision, the letter that started it all. >>What was the hardest part about starting your own business? Having patience, hands down. I am not a patient person in anything, and throughout this entire experience I had to learn patience. I knew I could not afford a vehicle payment in school so I worked at the hotel for a year after my ah-ha moment paying double payments. Ironically, I smashed up that little Scion TC near the end of my time in hair school. Oof, it was quite the trying year. The second hardest thing was the emotional stripping I didn’t know I was going to experience. I was 28, financially independent . . . independent in general, and all that freedom was taken from me. I didn’t realize what that was going to do to me emotionally until I was deep in it. 2013 was a hard year for me . . . to be completely honest I still feel a sting in my gut from the past as I write this. I was so emotionally lost and broken, but I have learned that sometimes life breaks you in order to build a stronger you. My foundation needed to be shattered in order for me to rebuild a stronger more emotionally in tune version of myself. Boy, it was a long process. As far as logistically and aesthetically my vision was clear (thank you Pinterest). These two things were never really “hard” for me. I had a clear aesthetic vision and an unwavering trusted gut feeling that logistically it was just going to work out when the time was right. Financially things freaked me out from time to time, but again . . . I just knew it was going to work out. I did save every penny and dime I could during this process knowing and trusting that “one day” I’d use it to open up a salon. So to recap . . . the hardest pieces in this journey thus far have been patience and the emotional instability. I have learned to be better with patience and believe this was God’s way of teaching me this virtue. I also believe God knew that I needed an improvement to set a solid foundation of who I am. To this day, I am still sad that this part of my life was lead with my head down . . . however, I am extremely grateful for the struggles that shaped me and that my perspective on life is light. I am a lover of quotes and during the toughest of times there were a few that held me together. Those being . . . “The future belongs to those who believe in the beauty of their dreams” “Let passion devour laziness” and “Start Somewhere.” I would literally take a breath when I read those words and be like . . . “Yes, okay. I got this.” I love quotes so much that I have my color clients write me a quote during their processing time. A few of my favorites so far are . . . “Real queens fix each other’s crowns” and “You have to be odd to be number 1.” I post up the quotes in this mini porcelain pig I bought from Magnolia Market, and rotate a couple of them at a time. Find quotes that inspire you. Ones that give you fuel. Try your darndest to not let the crazy affect your personal relationships. Starting something completely unknown is uncomfortable, and uncomfortable feelings feed shadowed emotions. I was not the best version of myself during these trying times and that is still hard for me to accept. Do not allow the unknowing emotions hinder the relationships closest to you. Trust. Looking back I knew where I was going, I fully believed in my vision with my whole heart . . . I just wish I would have enjoyed the moments more. I was so forward focused I forgot to live, and like I mentioned above this too is still hard for me to accept. I honestly lost years, and you can’t set back the clock on the choices you make. Keep your vision clear, but enjoy the ride (even the bumpy parts). It’s all temporary. I marked my savings account “DO NOT TOUCH.” This helped me. Save any amount you can. $1 is a $1. Even if it’s a small amount, in the end it makes a difference. As you can see I struggled during this time, but I also believed in myself. Believe in yourself, even if others don’t. Bulldoze naysayers (not literally, but in your mind), and shine your light in the darkness. You only need to see one step in front of you to get where you’re going. I wrote down my ideas in the notes section of my iPhone, and would Pinterest ideas any chance I could get. Writing down my ideas and seeing photos of the things I sought made my dream real. I searched pictures of ‘open and closed’ signs, wallpaper, décor, décor, décor, marketing tips, you name it. I am so happy I did this because there are about 842 things happening at once when it is time to start moving, and come “go time” this helped me tremendously in reminding me what it was that I actually wanted. Pinterest your ideas. Write down your unique ideas as soon as they pop in your mind. When it comes time to open your business you’ll be so thankful for all of this. Breathe. Balance. Believe. Whatever that looks like for you . . . breathe, balance, believe. Mission Statement: My goal for clients to recognize their own individual beauty, one that is uniquely theirs. My vision is for beauty to be seen not only in hair, but in the simple gifts we are awarded each and every day. Wearing whatever I want. LOL no, there are so many “favorites” being a small business owner (challenges too) but as they say . . . the rewards outweigh the risk / trying moments. A few favorites that come to mind are . . . I get to talk and learn from my wonderfully awesome clients all the while sprucing up their ‘do. “The look” — it is the look a person gives themselves in the mirror, like . . . “Heck yea, I like what I see.” Knowing that I helped someone gain confidence in who they already are has got to be one of the most rewarding gifts a hairstylist can have. As a stylist and business owner I am allowed to express myself in so many creative outlets . . . from hair, to décor, attire, products, marketing, etc. and to me . . . that is freedom. Karen Dahl, you shining soul . . . thank you for giving me a platform to tell my story. The “broken circle” in The Shop Salon’s logo is an ensō circle. When I found out the meaning behind this expression of art I knew it was made for The Shop. The ensō . . .
: : Is created in a single brush stroke reminding us to appreciate the beauty in each moment. : : No two are the same. : : The break 1). Signifies how moments in life are imperfect, but perfect and 2). Illustrates that we are not closed off from the universe, but instead reminds us that we are part of something greater than ourselves. So . . . just as no to ensō circles are the same, no two humans are the same. We are all imperfectly perfect human beings existing together in a universe greater than ourselves. Live in the moment, experience the beauty, embrace what is #uniquelyyours and go on with your imperfectly perfect self! dear avocado toast, i miss you. It’s Day 14 of the Whole30 so I thought I’d check in since we are officially half-way through! This is kind of odd because I am essentially interviewing myself, but these are some common questions I get when I am doing a round of Whole30. Enjoy! Are you loving this round of Whole30?Honestly, not really LOVING it, but tolerating it. It’s the sad truth. This is my fourth round and I’m in the boredom phase of the program. That means there’s a lot less ‘new to me’ things going on and way more ‘I’ve done this before, yeah yeah yeah’ going on. What do you hope to get out of this round? I needed a break from alcohol. I love me some wine, but I also love to give the liver a rest. So many things revolve around alcohol, work-socializing included, so I wanted to remind myself that you don’t need to have a glass of wine to ‘fit in’. This all goes back to my ‘what is a special occasion’ self-discovery mission. My carb intake was getting a little high, and I was starting to move into the gluten-zone. Which admittedly won’t kill me, but if I do it enough over a long period of time, I get the puffy face, abdomen, and delayed digestive distress. It’s been good to find some other foods for my carb intake like all forms of potatoes and yams. I wanted to eat more greens. Whole30 basically forces you to eat greens, which can be quite the shock to the system if you haven’t been doing so for quite some time! I have been upping my kale intake to the point that I’m not sure I can live without it. Debloating. A combination of eating more veggies, no processed carbs, no alcohol leads to a debloating party. Week 2 is when I usually see the bloating significantly subside. Once you truly debloat, it’s easy to identify what foods cause severe bloating. Plus, bonus is that your clothes fit so much better. Will you do a ROUND 5?! What are you go-to’s in your fridge and pantry? Potatoes and squash – in both original and spiral form. Do you like the Whole30 Day by Day book so far? Yes – the Day by Day book is certainly motivating and is very helpful (and probably even more helpful for people who haven’t done this before). I have skipped a few days because I forgot, but essentially it reminds you to think about why you’re doing a Whole30. It gives you snippets into how you’re likely feeling and why that is, and it also forces you to reflect on your energy, sleep, meals, and non-scale victories. It does feel a bit like homework but generally, low maintenance. Are you going to do anything differently in your last 2 weeks? Yes – I will be switching up my supplements a bit in the morning. I’m adding in a digestive enzymes and some Vitamin D (thanks, winter). It’s important to me to keep my immune system (and therefore digestive system) strong, so I think this will help me get to the next level of feeling good. I’m still experiencing some unexpected digestive discomfort so I’m crossing my fingers this helps. How do I find out more information about this program? Easy – just go to the Whole30 website. It has everything you need to get started, including support groups and forums. There are a few different cookbooks (plus Day by Day) that will assist you with new recipes too! While eating Whole30 (essentially Paleo) isn’t for everyone; it’s definitely worth a shot if you’re looking to eliminate troublesome (to you) foods from your diet. This post is going to be short and sweet; I apologize it’s been awhile since I’ve last posted but I have a pretty sweet lineup of material coming in 2018 so don’t give up on me just yet! Dispose of old bills, receipts, medical/dental/doctor papers, prescription papers, etc. Decluttering and organizing can really lift weight off your shoulders and lead to feelings of accomplishment. Little accomplishments truly make the biggest differences! Even minor decluttering gives instantaneous satisfaction, so it doesn’t hurt to start small and make your way up to tackling larger projects… (cough*yourcloset*cough). Use my Passion Planner to set intentions and goals for each day – and incorporate Melody Beattie’s Journey to the Heart. Run a 15k – I’ve been toying around with this idea for over a YEAR and I’ve finally decided to commit to completing a 15k in February. That means sticking to a strict training schedule for the next 5 weeks — pray for me. Learning to say ‘no’ to activities I do not want to do – how many times have you gone along with someone else’s plans and you end up spending too much time or money on something that didn’t serve you? Finally, the January Whole30 is here! Today is Day 1 of Whole30 and my intention is to share each week with reflections, tips and tricks with all of you. This is my fourth round of Whole30 and I am so proud of how far I’ve come with learning new recipes, identifying problematic (to me) foods, and learning to read food labels. Follow me on Instagram to see more frequent posts over the next 30 days (@kdahl.mpls). This morning I’m sitting on the couch with a hot cup of (black) coffee enjoying the first morning of the new year, excited for a year of intention, health, and balance. What are you letting go of from 2017? What are you welcoming in 2018? I’m so excited to share some insight to my dear friend’s blog – Molly Osborn’s ‘The Pretty Now’. Molly and I go back to college, where we both found passion in event planning and finding ways to express creativity through various outlets. Molly just recently launched her blog (her platform she’s been talking to me about for over a year). I want to share her thoughts on blogging, what inspired her to blog, and what her blog means to her (and her followers). Please check out her space: https://www.theprettynow.com/. Enjoy! 1. What does The Pretty Now mean? ‘The Pretty Now’ is a testament to myself. It’s my personal pursuit of a pretty mind, heart, body & soul. It’s consciously working every day to have kinder thoughts, kinder words, kinder actions, purposeful connections with friends and strangers alike. A commitment to strengthening my body, my mind & pursuing only the things that enrich my soul. 2. What is vision and the purpose of The Pretty Now blog? What are you trying to accomplish using a blogging platform? Number 1 answers part of this question – but as for what I’m trying to accomplish: Simply put, I love to write. For me, the purpose behind the blog is for a creative outlet for myself. But I’m extremely passionate about people and making connections. If people read my blogs and in someway connect to something I’ve written, if they say “yeah, I get that” or “wow, me too” – that would be a dream come true. There’s nothing more powerful than that raw, authentic connection to another person because of shared or similar life experiences. 3. What type of content can your readers expect from your blog posts? I’m someone who really speaks from my heart, so a lot of my content will be reflective of what’s on my mind and in my heart that day. Lessons learned in the workplace, every day life or in marriage. Experiences that cause me to think deeper about things in a new way, I’ll be sharing them and writing them on my blog. You can also expect to see pieces of my life at home, my style and approach to fashion. Another topic I’m passionate about is health. I’ll be sharing my health and wellness journey through classes I love to attend, newest recipes, etc. 4. Who inspired you to create a blog – what other blogging platforms or accounts have you looked to for inspiration? I wouldn’t say that I was necessarily inspired by any one person to create my blog. Like I mentioned, I love to write. I’ve always loved to write. I often feel really passionate about experiences I’ve had and felt a need to share them. Not necessarily for people to read, but to process what I was experiencing and thinking. Throughout college, I did this in a personal journal. Writing was always so freeing. A way to get things off my mind – good or bad things alike. As I’ve grown and matured, my platform for sharing these thoughts and experiences changed. It started with an Instagram account that I used to keep private from people in my personal life, haha! I was using it to connect with other like-minded creatives and to feel that support for similar interests, struggles and triumphs. The Instagram started to take shape and I began to let down my walls a bit (literally, I stopped blocking people from my personal life who found me) and allowed people to follow along. I set a goal at the beginning of 2017 to finally take the leap and create my personal blogging space and take my writing to a new platform. It took me nearly a year, but I launched it in November of 2017 and I’m incredibly proud and excited to be in this space. 5. What logistical steps did you take to start your blog? I was really lucky to have a friend of mine who is an artist and blogger (Katie Ryan – @queenikathleeni) to help me with the initial process of creating a blog. She quite literally started my platform for me and showed me the ropes. The first platform I was on was WordPress. This platform offers free templates and is a great place to start for people who aren’t quite sure what they’re wanting out of their blogging and don’t want to pay for a site (which was me at this point!) However, the more I toyed around with WordPress the less I liked it. I ended up switching over to Squarespace and purchasing a template/web domain. It was scary to make that jump into paying for the platform, but I’m so happy I did. Squarespace is extremely user friendly. Especially for someone like me who is NOT tech savvy. I’ve had such a great experience so far and would recommend it to anyone looking for a great blogging space! 6. What advice would you give to someone who is looking to use blogging as a creative outlet? The advice I would give to someone who’s looking to use blogging as a creative outlet is DO IT! If you’re passionate about something, embrace it. I know there are a lot of fears that come with starting a blog, I’ve felt them myself. What will people think? Will anyone read it? Is it stupid? But if we can shift our thinking and realize that this is something that brings us joy, allows creative freedom, releases stress & fuels a passion in us…then it’s easier to take the leap. 1. How did you know you wanted to start your own business? What was your ‘breaking point’, or your true motivation for starting your own ventures? It wasn’t until I was approached to be a partner in a new venture that I thought of starting a business. The idea and challenges of building a trust company from the ground up was a bit overwhelming so I relied on my “gut feeling” to move forward with it. The people involved in starting the business had complete confidence in me which made the decision a bit easier. In hindsight, it turned out to be the best career move I ever made. 2. What are your largest accomplishments and what do you attribute those to? Our company has experienced many accomplishments over the past 16 years. We’ve grown from 2 employees in 2001 to 28 employees in 2017. We reached a big milestone in 2014 by surpassing $1 billion in assets under administration. This is all attributed to our awesome staff. Our employees are not only well educated and talented in our industry, but they are genuinely good people. I share this accomplishment with all of them. 3. What are your top 3 lessons learned? How did you overcome these shortcomings? Lesson #1: Take advantages of outside resources and networking – You will never know it all. Take advantage of the opportunities to learn from others and learn from your mistakes. Being in banking and trust for over 30+ years I’ve been fortunate enough to surround myself around many experienced people. Lesson #2: Don’t get too hung up on immediate success – It takes time to build confidence and credibility but with hard work, a positive attitude and a little luck, success will follow. In the meantime, don’t forget to take time for yourself and family. Lesson #3: Don’t resist change as change is inevitable – This is huge. When I look back when we started FPTC and compare it to now, just about everything has changed. Technology is more advanced, compliance is more complex, succession and management planning has shifted into full swing. We were a very fast growing company so it was necessary to constantly review our policies and procedures to keep up with managing risk. 4. What personality traits and skills do you think are important for future entrepreneurs to have? Entrepreneurs need to wear several hats, especially in the beginning phase of a new business. However, as the business grows it’s important to be able to build trust in the staff and delegate duties. It’s also important in business to exercise patience, maintain a positive attitude, and have a strong work ethic. In our business, we need to be professional in our decisions, but personable in our approach to our clients and centers of influence. 5. What resources and support systems (professional, educational, personal) have you used to help you through your journey? My best resource in learning this business was always right next to me. We’ve added very experienced and educated people that have worked in the trust business for many years. In fact, several of our employees were people I once worked with when I started out in the trust business in 1989. I also have developed relationships with our systems providers that offer conferences and continued education. I was able to learn specifics about trust operations and security processing by completing a very intensive three-year course provided by an accredited school that specializes in trust and banking careers.